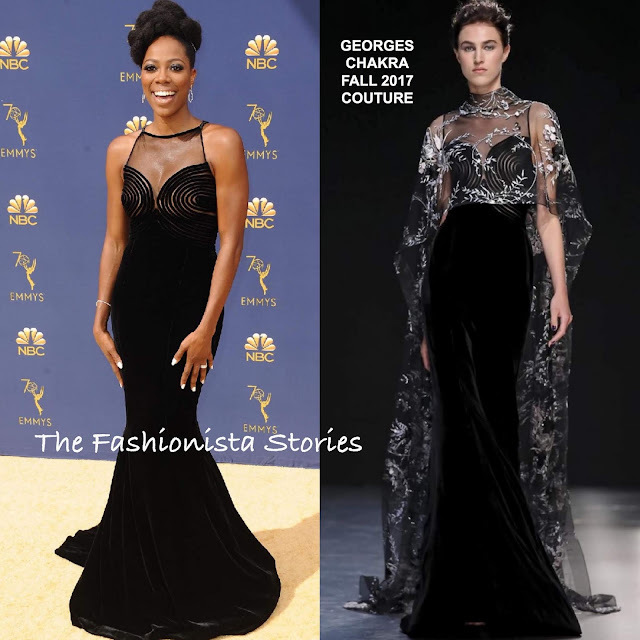 While Yvonne Orji is not a red carpet regular, I do like her style. The 'Insecure' actress attended the 70th Primetime Emmy Awards this evening(September 17th) at the Microsoft Theater in LA. For the occasion, she wore a GEORGES CHAKRA FALL 2017 COUTURE black velvet mermaid gown, featuring a sheer panel bodice. On the runway, Yvonne's gown was layered with a sheer embroidered cape which I kinda miss and think she could have pulled off. However she still delivered a winning look without it. A flawless beauty look and sparkly jewelry finished up her elegant look.